A week ago Invisible Children released a video that was immediately picked up and promoted by every corporate news and entertainment outlet till it went “viral”. Kony 2012 allegedly “promote awareness” of and contributes to the end of child soldiering in Africa. But is that really what it’s about?Is it, like the old Save Darfur war dance, another propaganda campaign to justify US intervention in Africa? Thanks to relentless promotion by Fox News, CNN, MSNBC, Bloomberg News, ABC, CBS, Oprah, celebrities and politicians of both corporate parties, along with right wing church groups and foundations, the Kony 2012 video has “gone viral.” Viewed on YouTube more than a hundred million times by now, it paints a vivid and simple picture, clear enough, its narrator says, for a five year old.Joseph Kony, the YouTube video tells us, is a bad guy in Uganda, a lawless warlord leading something called the Lord’s Resistance Army, which kidnaps, enslaves and murders innocent children by the tens of thousands. Just why Kony does this is unclear, but we’re told the Ugandan government would gladly shut him down and bring him to justice if only the US would provide the advanced weapons, sophisticated tracking gear, military training and the boots on the ground to help get it done. To make this happen, all that Kony 2012’s promoters ask of us is to help spread “awareness” of Uganda’s “invisible” child soldiers by facebooking, tweeting and repeating the Kony 2012 video, and by emailing influential politicians and the one-name celebrities like Oprah, Bono, Rhianna, Cosby and Lady Gaga (OK, Lady Gaga is two names) to whom they listen. The Kony 2012 video aims to bring the criminal child-enslaving Ugandan warlord to justice by enlisting tens of millions of us little people in making Kony’s name an odious household word around the planet, after which Washington DC will stretch forth its military arm to bring Kony, alive if possible, before the International Criminal Court for trial and punishment.Almost everything is wrong with this simple picture, from the missing histories and hidden motives of storytellers and players to false statements of processes and problems real and unreal on both sides of the Atlantic. In fact, Kony 2012 is not a search for justice. Kony 2012 is a corporate-style PR and military psy-ops campaign, a cynical hoax engineered to justify US and Western military intervention to control the incredibly lucrative oil, mineral, water and strategic resources of the heart of Africa. The video tells viewers not to study history, but to make it. 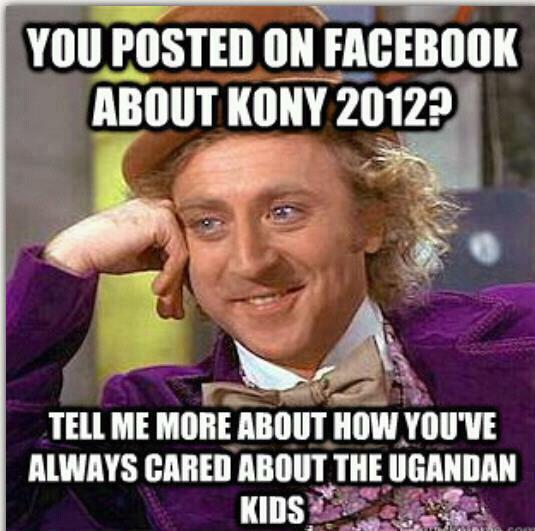 Kony 2012 does not promote “awareness “. It relies on and promotes ignorance and smug racism. Excellent article…….articulate, intense, funny………you convinced me……but then, the true horror or “western do goodism” is not new to me.